Drugs for Head Lice | The Medical Letter, Inc.
PYRETHRINS — Pyrethrins are natural extracts from chrysanthemum flowers that are neurotoxic to lice. They are available over the counter (OTC), usually combined with piperonyl butoxide (Rid, and generics) to enhance their activity. Pyrethrins are unstable in heat and light, do not kill all unhatched eggs, and require multiple treatments because they have no residual activity. Allergic reactions occur rarely in patients with ragweed or chrysanthemum allergy. Resistance to pyrethrins is now widespread. PERMETHRIN 1% — Permethrin 1% (Nix, and generics) is a synthetic compound based on the insecticidal components of natural pyrethrins. Like pyrethrins, it is available OTC and resistance is widespread. Recent clinical studies have found that the effectiveness of permethrin has declined to 25% in the US.2 Head lice that are resistant to permethrin 1% will probably also be resistant to permethrin 5%, which is available by prescription for treatment of scabies. Adverse effects of permethrin include pruritus, erythema, and edema. MALATHION — Organophosphate insecticides such as malathion are extensively used in agriculture. An irreversible cholinesterase inhibitor, malathion is pediculicidal and partially ovicidal; retreatment is usually not necessary. The labeling for malathion 0.5% lotion (Ovide, and generics) recommends applying it for 8-12 hours, but one small clinical trial found one or two 20-minute applications 98% effective in eradicating lice and viable eggs.3 Malathion is malodorous and highly flammable; patients should be warned not to use a hair dryer or curling iron after applying it.4 Stinging sensations and chemical burns have been reported after application. Resistance of head lice to malathion has been reported in Europe, but not in the US.2 The US product contains terpineol, dipentene, and pine needle oil, which also have pediculicidal properties. Malathion is classified as category B (no teratogenic effects in animals) for use during pregnancy. BENZYL ALCOHOL — Lice exposed to benzyl alcohol 5% lotion (Ulesfia) are thought to lose the ability to close their respiratory spiracles; the lotion vehicle then obstructs their airways and causes them to asphyxiate. Benzyl alcohol has no ovicidal activity. In clinical trials, benzyl alcohol 5% lotion eliminated all live lice in about 75% of patients examined 14 days after completing two treatments given one week apart. Resistance has not been reported. Eye irritation and contact dermatitis can occur.5 Intravenous administration of products containing benzyl alcohol has been associated with neonatal gasping syndrome, but absorption is minimal after topical application. Benzyl alcohol is classified as category B (no adequate studies in pregnant women; no teratogenic effects in animals) for use during pregnancy. SPINOSAD — Spinosad 0.9% suspension (Natroba) is a semi-synthetic fermentation product of the soil actinomycete Saccharopolyspora spinosa that causes neuronal excitation in insects, leading to paralysis and death. It appears to be ovicidal; retreatment is usually not necessary. Spinosad suspension also contains 10% benzyl alcohol, twice the amount in Ulesfia. 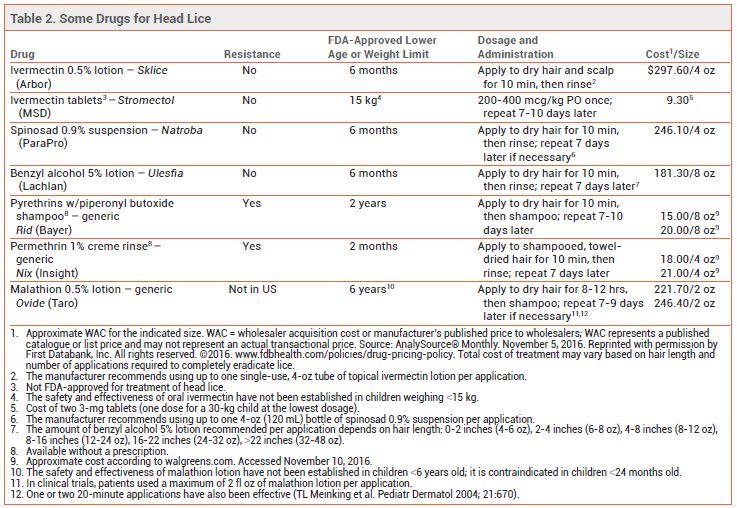 Among patients who received 1 or 2 treatments with spinosad, 85-87% were free of lice 14 days after the last treatment.6 Resistance has not been reported. Erythema and irritation of the scalp, and rarely the eye, can occur.7 Spinosad is classified as category B (no adequate studies in pregnant women; no teratogenic effects in animals) for use during pregnancy. IVERMECTIN — Ivermectin is a fermentation product of Streptomyces avermitilis, a soil-dwelling actinomycete. It binds to glutamate-gated chloride channels in parasites such as lice, inducing paralysis and death. Ivermectin 0.5% lotion (Sklice) is not directly ovicidal (hatchability does not decrease), but lice that hatch from treated eggs die within 48 hours after hatching, so retreatment is usually not necessary. The combined results of two double-blind, vehicle-controlled clinical trials showed that 74% of patients were lice-free on day 15 after a single treatment with ivermectin 0.5% lotion compared to 18% of those treated with the vehicle alone.8 Resistance has not been reported. Adverse reactions to ivermectin lotion, reported in <1% of patients, have included conjunctivitis, ocular hyperemia, eye irritation, dry skin, and a burning sensation.9 It is classified as category C (no adequate studies in pregnant women; maternal and fetal toxicity in animals with high oral doses) for use during pregnancy. LINDANE — Lindane has low efficacy and is neurotoxic; it is not recommended for treatment of head lice. ALTERNATIVES – Manual removal of lice and nits is an alternative to pesticides, but should not be used as sole therapy except in very young children for whom pediculicidal drugs are contraindicated. Several comb products (Lice Comb, Lockomb, Licemeister, and others) have been approved by the FDA as alternatives to chemicals or as adjunctive treatment. For nit removal, particular attention should be paid to those located within 1 cm of the scalp; nits are not likely to hatch at temperatures lower than those near the scalp. High concentrations of topical dimethicone, a silicone compound, are thought to smother lice by blocking their ability to excrete the water taken up when feeding on blood. Three randomized trials in Europe, where dimethicone is widely used for treatment of head lice, found that products containing concentrations of 4-92% were 70-97% effective in eradicating lice by 9-14 days after treatment.15 A liquid gel formulation containing 100% dimethicone (LiceMD Pesticide Free) is available OTC in the US. In a small open-label US study, 96.5% of patients were free of live lice and 80.7% were free of viable eggs 14 days after 1-3 treatments with 100% dimethicone gel (plus combing to remove lice and nits).16 Dimethicone is not absorbed through the skin. CD Devore et al. Head lice. Pediatrics 2015; 135:e1355. E Koch et al. Management of head louse infestations in the United States—a literature review. Pediatr Dermatol 2016; 33:466. TL Meinking et al. Efficacy of a reduced application time of Ovide lotion (0.5% malathion) compared to Nix creme rinse (1% permethrin) for the treatment of head lice. Pediatr Dermatol 2004; 21:670. Malathion for the treatment of head lice. Med Lett Drugs Ther 1999; 41:73. Benzyl alcohol lotion for head lice. Med Lett Drugs Ther 2009; 51:57. D Stough et al. Efficacy and safety of spinosad and permethrin creme rinses for pediculosis capitis (head lice). Pediatrics 2009; 124:e389. Spinosad (Natroba) topical suspension for head lice. Med Lett Drugs Ther 2011; 53:50. DM Pariser et al. Topical 0.5% ivermectin lotion for treatment of head lice. N Engl J Med 2012; 367:1687. Ivermectin (Sklice) topical lotion for head lice. Med Lett Drugs Ther 2012; 54:61. O Chosidow et al. 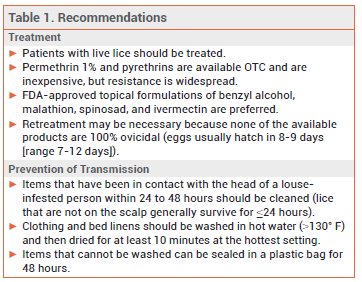 Oral ivermectin versus malathion lotion for difficult-to-treat head lice. N Engl J Med 2010; 362:896. A Nofal. Oral ivermectin for head lice: a comparison with 0.5% topical malathion lotion. J Dtsch Dermatol Ges 2010; 8:985. TL Meinking et al. Assessment of oral ivermectin (200-400 mcg/kg) in treating head lice infestations. Presented at the 5th International Conference on Phthiraptera (ICP5), Park City, Utah, August 2-7, 2014. VM Bowles et al. Abametapir lotion 0.74% demonstrates high elimination rates of head lice with a single application in phase 3 trials. Presented at American Academy of Pediatrics 2016 National Conference and Exhibition, San Francisco, CA, October 22-25, 2016. Abstract 319920. VM Bowles et al. Ovicidal efficacy of abametapir against eggs of human head and body lice (Anoplura: Pediculidae). J Med Entomol 2016 Aug 21 (epub). IF Burgess and P Silverston. Head lice. BMJ Clin Evid 2015 Jan 14; pii:1703. ES Ihde et al. Safety and efficacy of a 100% dimethicone pediculocide in school-age children. BMC Pediatr 2015; 15:70. N Kaul et al. North American efficacy and safety of a novel pediculicide rinse, isopropyl myristate 50% (Resultz). J Cutan Med Surg 2007; 11:161.